Recently, when I interviewed Ellouise (Diggle) Scholettler (one of this area's most popular "storytellers") for the Fairfax VA cable TV station, it occured to me that CHS had graduated more than it's share of great "storytellers." 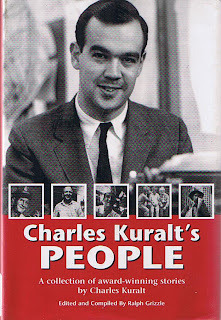 One of the most famous, of course, was Charles Kuralt. In the 40's there was Marion Hargrove, author of "See Here Private Hargrove," perhaps the best selling book about the average soldier in WW2. And then, there's Jan Karon (Janice Wilson) of our class who has become very famous (and rich) from her best selling series about the "Mitfords." Now there's another name that should be added to that list: John Brock. You've all seen the video production that he produced for the Class of '50 (which by the way, has gotten over 300 "hits" since this website posted it on the internet just a few weeks ago!) It's great. I recently learned that he's also one of the best writers and tellers of life in the South in the country. 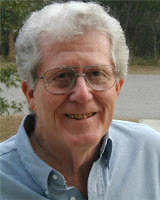 By reading his latest book, called SOUTHERN BREEZES WHISTLE DIXIE. "South finally got even....with snake farms, speed traps and time shares"
"What happened to magic words: "yes ma'm, no sir, thank you, I'm sorry"? "Give a Southerner a hog and he will never go hungry again"
and "Lord grant me patience, and do it right now"
In the Spring of 1954 the radio stations in Charlotte had a contest to see which station had the most popular DJ. The winner would be determined by which DJ's listeners contributed the most money to the March of Dimes campaign. A couple of weeks prior to the contest Genial Gene had been kind enough to appear at the big Key Club talent show of that year and provide some real professional entertainment. The show was very successful. It raised $1000 for the club....to go to charity. The vote was taken and the charity of choice was......the March of Dimes. It was bequethed to them is the form of VOTES for Genial Gene. It sounds like a speech course testimonial, but it’s only the personal declaration of Genial Gene, he of the radio couplets and the glib tongue. His public, which tunes in WGIV at 6 and 11am and 1,2, and 3pm Monday through Saturday and all day on Sunday, gets an earful of literature. Genial Gene (whose last name is Potts, by the way) talks in rhyme. 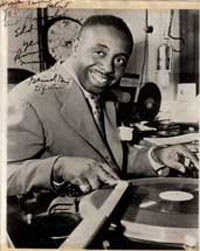 Genial Gene won top disk jockey laurels in the city a couple of years ago, after 1,000 votes from Central High School pushed him over the top. This week, he’s celebrating his eighth year on the air. On the “giving end,” he’s on the TB Association board, works with the March of Dimes, the Boy Scouts, the YMCA, United Appeal, Elks, AME Zion Church, and more civic committees than you can wave a microphone at. “I don’t have sense enough to say no.” Genial Gene finishes work on his Christmas committee” and sprays that Yule geniality over the air. It goes like that all the time. The press agent was a little over-enthusiastic. But give the old stammerer a few more years. It happens every March. Wall to Wall Basketball. Never bet against "the Bulls!" 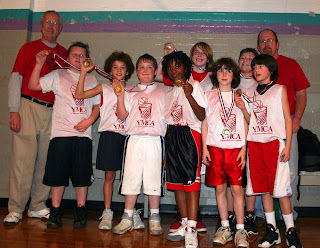 Now of course I'm talking about "the Bulls" who are the West Forsyth Y 10-year old League Champs who play in the old Clemmon's Gym right outside Winston Salem, NC. Their secret weapon is Warren Hill who just happens to be the grandson of our own Warren Sparrow, who just happens to be the coach of the Bulls along with Warren's father Mike Hill. Getting members of our class to talk about their grandchildren is like trying to get big olives out of small jars....or...pulling teeth....or whatever. But I was able to pry some of the details out of the former Basketball star and Rambler journalist extrodinaire. It seems that the Bulls got off to a rocky start, having to forfeit the 1st game of the season due to prior commitments by 4 players. The remainder of the season went very well as the Bulls reeled off 7 straight victories by applying constant defensive pressure and using a very balanced offensive attack. After finishing the regular season at 7-1 and entering the post-season as the #1 seed the Bulls won in the 1st and 2nd rounds of the playoffs to setup a long awaited match with a very strong team coached by Jim Flynn. The championship game was played in the Old Clemmons Gym on Friday February 8th. The Bulls won by a score of 26 – 17. The Bulls were led by Warren Hill with 14 points and 15 rebounds in the Championship game. Coach Sparrow one of the stars of "The Dream Team" of the 1954 Charlotte YMCA, (see earlier post on this website) said after the game what a pleasure it was coaching "The Team of Destiny." "... the kids responded to our coaching in a wonderful way. Please tell Coach Edelman how well his fast break of 1953-4 worked in 2008. Who would have thought that an AG boy would thank a Piedmont coach for making a dream season!" Warren and Becky Sparrow live in Winston Salem, NC. Their daughter Dora is Warren Hill's Mom. Mr. Pope, 72, died at Huntersville Oaks after a courageous fight with Brain Cancer. A native of Mecklenburg County, he was born in Charlotte, NC on April 3, 1935 son of the late James Pope and Elizabeth Henderson Pope. He was a United States Army Veteran and attended Charlotte College. He retired from AT&T (Alcatel-Lucent) after 30 years of service. Mr. Pope is survived by his wife, Doris Scronce Pope; daughters, Tracy Case, Terry Burgess and husband, Chris Burgess; son, Marcus Pope; stepdaughters, Lori Bogan Brown; Stacie Bogan Wolfe and husband, Edward Wolfe; four grandchildren, Chad Case, Kalyn Case, Taylor Fossett, Randi Fossett, five step grandchildren, Jennifer Norwood, Michael Brown, Dillon Brown, Wesley Wolfe, Joshua Wolfe, Lauren Burgess and Halen Burgess; and sister, Jackie Yandle of Conway, SC.The family wishes to thank the staff at Huntersville Oaks and Hospice of Lake Norman for their generosity and kindness. A service to celebrate his life will be held at 11:00 AM Monday, March 3, 2008 at the Chapel of St. John's Baptist Church, 300 Hawthorne Lane, Charlotte, NC. The family will receive friends from 4:00 - 6:00 PM on Sunday, March 2, 2008 at J. B. Tallent Funeral Service, 1937 Sharon Amity Road, Charlotte. Memorial donations may be made to "The Preston Robert Tisch Brain Tumor Center", Duke University Medical Center, DUMC Box 3624, Durham, NC 27710, Hospice of Lake Norman, 705 Griffith Street, Suite 203, Davidson, NC 28036, The Humane Society of Charlotte, NC, 2700 Toomey Ave., Charlotte, NC 28203. Condolences may be shared on line http://www.tallentfuneralservice.com/. J. B. Tallent Funeral Service is serving the family of Mr. Pope. Published in the Charlotte Observer on 3/1/2008.